Engagement Ring Wall: A better way to shop for engagement rings online. Use your Ring Box to save rings for comparison, opinions, and purchase! Sign up now for all this and more, including exclusive coupons! 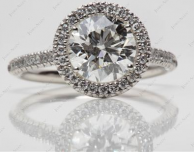 Gorgeous halo engagement ring for an oval diamond! The thin platinum band is durable and shiny, perfect for emphasizing your center diamond and its halo. Stunning, modern engagement ring featuring an "art deco" frame with pave diamonds on a simple, platinum band. Your center diamond, which can be princess, radiant, or asscher cut, will be showcased by the beautiful ring that surrounds it. Round diamonds form a sparkling frame around your center diamond, with more pave diamonds decorating the platinum band. They say that you can only set this ring with a round diamond, but we're 99.9% sure that you can also set it with a cushion cut diamond. This ring is an absolute work of art! Sparkly, exquisite, amazing art with diamonds all over -- the best kind! Just seeing the online pictures of this ring dazzled me, I can't even imagine if I saw it in person... Anyway, you want some details, don't you? Well, this ring packs a lot: halo diamonds, split band, pave diamonds on the band... seriously awesome. The one downside? You can only fit a round diamond in this ring (not bad for a downside!). Gorgeous platinum engagement ring with pave diamonds making a halo around the center diamond, making it sure to stand out! This engagement ring creates an amazing frame for your center diamond with two rows of halo diamonds surrounding the center and pave diamonds decorating the platinum band. 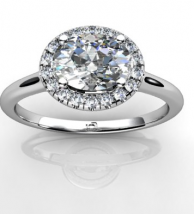 This ring can be set with a round diamond only and includes .49 ct total diamond weight for the pre-set diamonds. Halo diamonds on both the top and sides crown the center stone, and the platinum band is further accented with pave diamonds in this exquisite engagement ring. Choose the round diamond of your choice to set in the center and complete this ring! 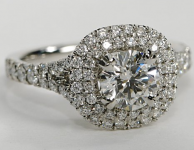 We think that double halo diamonds make your ring look like a big, sparkly lion's mane made of little diamonds. Interesting visual, isn't it? Anyway, this is an absolutely stunning ring, and you'll have a lot of trouble finding a ring with more sparkle. What features do we need to add to become your go-to engagement ring shopping site?